Our top arborist job this week involved cleaning up an acreage property. 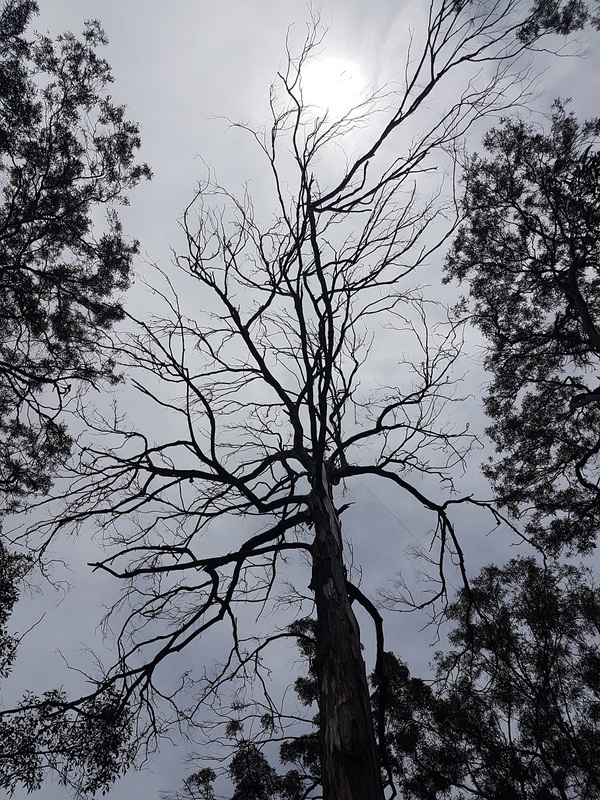 A very large dead gum tree was posing a threat to neighbouring properties. It had been regularly dropping deadwood from the canopy onto the ground below. Although this was not posing an immediate threat to the house some 30m away, it was dangerous for anyone mowing, playing underneath or heading to the nearby shed. It was also frustrating for the owners to be constantly cleaning up the fallen limbs. Furthermore, the tree was at risk of complete failure meaning that it could have fallen on either of the neighbouring properties. After a discussion between our arborist and the homeowner, it was decided that the best course of action was to remove the canopy but leave the trunk in place as potential wildlife habitat. Our skilled arborist first of all set safety lines in the tree, rigging the canopy to a nearby healthy gum tree on the same property. 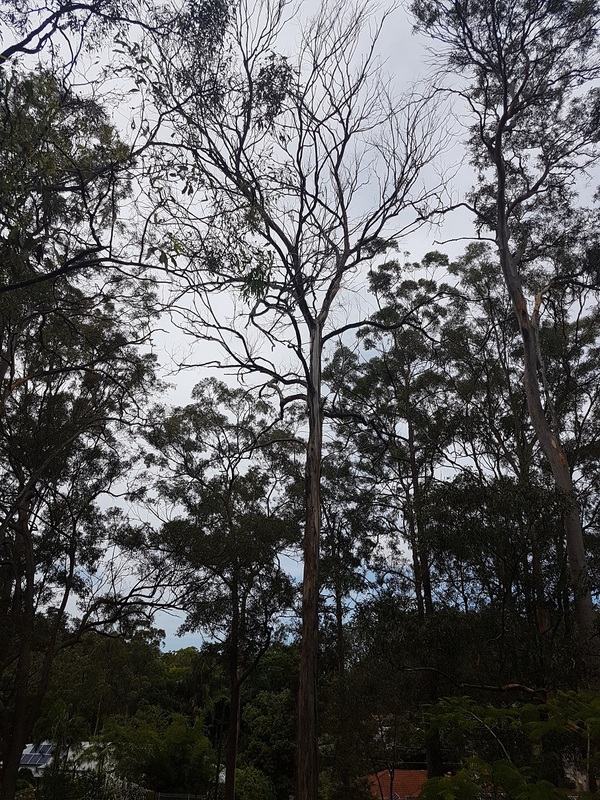 Two safety lines were tensioned between the two trees to ensure the stability of the dead gum during the cutting process. This also ensured that, once cut, the canopy fell in the intended drop zone. One rope ran through our petzle pro traxion secured at the base of the healthy gum. The second rope ran through a pre-tension pulley to a 4WD ready to pull the canopy away from the tree and the arborist in it. Our qualified climbing arborist then set his own climbing lines in the tree. The wind played havoc with the Big Shot Slingshot, making it nearly impossible to set safe climbing ropes at the base of the canopy. Persistence paid off though, and soon our arborist was on his way up the tree. He made the face cut and removed the front wedge. Finally, with all rigging tensioned up, the canopy was professionally cut from the tree. The time taken to precisely set all rigging and cuts ensured that the canopy fell perfectly into the drop zone...where it shattered into beautiful pieces of firewood for the homeowner. We further cut up the larger limbs for next winter's firewood supply. In addition to the dangerous gum tree, the owner also had a large cocos palm which had overgrown its space in the garden. Cocos palms are now a declared pest species throughout South-East Queensland. This cocos palm had hidden amongst surrounding golden cane palms for quite some time. When it began dropping heavy dead palm fronds on the courtyard below, it was time to remove it. Our client also wanted to thin out the large clumps of golden cane palms. After thinning out the golden cane, the cocos palm removal was completed by felling it into the adjacent courtyard. The Kanga mini-loader did its job in removing the heavy palm trunk (40cm diameter) and loaded it straight into the chipper. The environment benefited from the removal of this pest, as the owner plans to use the palm mulch to aide the growth of his native gardens. After cleaning up and heading out, there was just one thing left to do: create a video of the day!